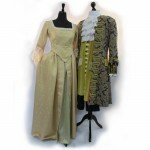 We have some early Georgian costumes (circa 1750) but most are later, from 1750 through to the Regency period. 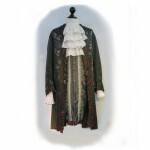 The Georgian style was coats for men, with long waistcoats, breeches and lace at the throat and wrist. Wigs were very fashionable for both men and ladies. Apart from nobility, we also have working class costumes, and characters. 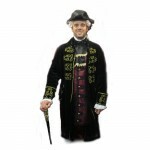 We are trying to add photos all the time, but we still have far more costumes than are shown here.